The bullethead/daisy parrotfish is an amazing and beautiful fish. Its scientific name is Chlorurus sordidus, no matter what language you speak if you see this name, it is for the Daisy Parrotfish. 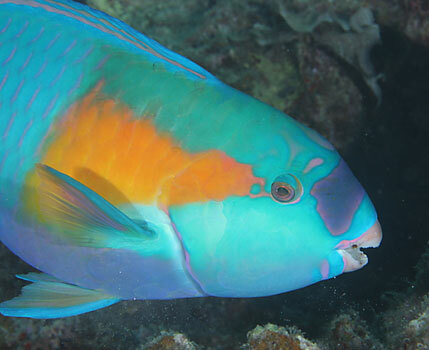 The parrotfish was given its name because it has a "beak" like a parrot and is very colorful. They brighten up the ocean and are great fish to view when snorkeling! At first they might shy away from people viewing them, but they get used to it very quickly and do not mind being observed. On my website you will learn everything from how and what they eat to where they spend their time. If you like my page and would like to learn more about marine organisms visit my school website, MultipleOrganisms.net. And who could forget Flipper, the Bottlenose Dolphin? !